The second regatta of the 1st National Sailing League kicks off this weekend at Travemuende Week. Eighteen sailors from the first division team from Luebeck Yacht Club are set to compete in the second round. For specators, the 'SAP Sail Cube' offers the chance to watch live sailing on the Baltic Sea, an opportunity to enjoy the thrills of a top-level competition which returns to Travemuende for the second time. Fans of the National Sailing League can watch the live broadcast at the venue or online at home. The partnership between Travemuende Week and SAP SE is what makes this live broadcasting event possible. Just as last year, the "SAP Sail Cube" is on site and used as a control centre for live broadcasting output. This mobile unit, housed within two 40ft shipping containers, contains a fully-equipped studio as well as a showroom with the latest sailing analysis technology. 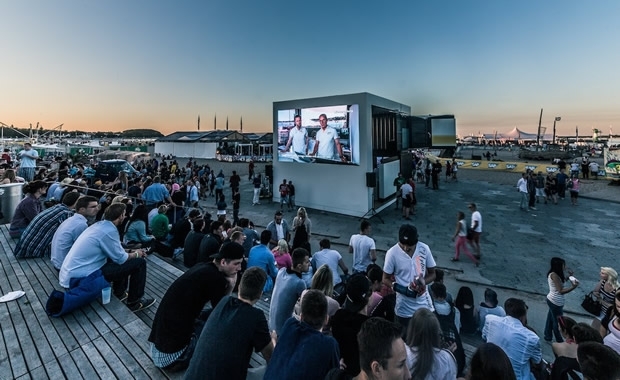 On the side of The Cube is a 16 square metre big screen for the perfect public viewing experience. With clear graphics and easy-to-follow explanations, the sport of sailing becomes easy to grasp even for non-sailors. The races of the Sailing League will be broadcast live on Saturday to Monday from 1pm to 3pm from the SAP Media Race Course - right at the mouth of the river Trave, commentated by four experts analysing the races. ZDF sports reporter Alexander Ruda returns fresh from the Football World Cup in Brazil, National Sailing League competitor Mathias Bohn will be on hand as an expert, and Olympic participants Tobias Schadewaldt and Marcus Baur will rotate in a supporting role, making best use of the SAP Sailing Analytics. Apart from the 'normal' 45 races of the National Sailing League, there will be the SAP Trave Races on Monday (21 July 2014) with the National Sailing League's participation. The top six of the regatta will be sailing on their J/70 boats just a few metres from the crowds lining the banks of the river Trave. This competition will be also broadcast live from 5 to 6pm.